Social Democracy for the 21st Century: A Realist Alternative to the Modern Left: Gold in a Bear Market? People I've talked to who are more libertarian or fond of the Austrian school have told me that gold is just going through a deep correction to paraphrase. I think gold and bitcoin have been nothing but bubbles in themselves. Hyperinflation predictions have been way off base and ridiculous though. Mish Shedlock was completely right about Peter Schiff and his inaccurate predictions. It's also really stupid for anyone to solely invest in gold or silver. Dave Ramsey once said that "gold is a stupid investment." A smart investor would have a diversified portfolio. Even if the economy is still depressed right now, a lot of people could have been profiting big time if they had invested more of their money in stocks. Just look at the 200 point rally in the stock market the other day! Even that had some people skeptical and claiming that federal reserve bond buying programs aren't a sign of the real economy growing. Enough ranting. Good post as usual, LK. I've learned more from this blog than many others and even though I probably don't share your political philosophy, I like how you're able to find lots of empirical evidence to back up your statements and also realize the importance of STEM in an economy. Daniel Kuehn has talked about STEM several times on his blog. I have no idea about "Rothbardians," but my portfolio is 100% stocks (tech heavy, and doing well). Anyone who kept their nerve during the crisis would have rebounded healthily, and anyone smart enough to buy calls once the S&P had fallen around half (not me, unfortunately) would have made out like bandits. I don't believe in strong EMH, but I basically follow a Malkiel buy-and-hold strategy. Even including the crisis, that's pretty hard to beat for simplicity and returns. I largely agree. I think gold is dead -- for now. But keep your eye on the S&P500. Phil.You done lot of real good analyzis that cut deep about those Austrians and the ideas,and motives behind their almost theological commitment to all those seemingly obscure ideas they promote,But what do you think lies behind their fanatic gold cult?Of course many of them peddling gold,but it can´t be the only reason.It must be more to it,i assume?I can´t really understand their obsession with gold. Ha! I already wrote about it! Austrian types confuse hoarding with saving. They are hoarding type of people. Which is why many of them also own lots of guns and sometimes underground bunkers (okay, only the more extreme ones...). It's all about hoarding. Same psychological function as someone who obsessively collects newspapers, or anything else. "Austrian types confuse hoarding with saving. They are hoarding type of people. It's all about hoarding. Same psychological function as someone who obsessively collects newspapers, or anything else." What on earth...? This did truly make me LOL--I'll give you the benefit of the doubt and assume this is a genius comedic troll. As a matter of fact, every year or two I make a special effort to donate or dump old clothes and books. I long ago got rid of all my CDs, and I just cleared out a whole shelf's worth of books after getting a Kindle. Really, this kind of armchair psychology is silly. It would never even cross my mind to say, "All Post-Keynesians like to ______," b/c I couldn't possibly have any insight into the personal habits or broader life attitudes of a group of people based solely on their economic beliefs. It's quite surprising to see someone who claims to want to make economics more scientific make such an unscientific generalization. I didn't say that all Austrians are compulsive hoarders. That would be absurd. I said that their proclivity toward gold illustrates hoarding tendencies. If you knew anything about psychology you would know that tendencies which show up in extremis in the mentally ill show up in more common forms in non-mentally ill people. The psychological mechanism is the same. The gold bug instinct is undoubtedly hoarding based. It manifests the same distrust of the outside world; the same desire to maintain some sort of "protected" internal world; and the same narcissistic closure to reality as psychopathological hoarding. It's actually rather obvious to any external observer that something is "up" with gold bugs. They're generally a bit weird. Actually, they're just manifesting personality tendencies that are caricatured in Dickins' A Christmas Carol. The gold bug instinct is undoubtedly hoarding based. "Undoubtedly" is a strong word. I suspect that the overemphasis on gold among Mises Institute Austrians is due to the undue influence of Rothbard, which is the same reason that they so zealously oppose fractional reserve banking. So the root cause is likely bad monetary economics, not "hoarding tendencies." Does an affinity for gold go hand-in-hand with "hoarding"? Offhand, Warren Buffet springs to mind--his thriftiness is legendary, yet he continually disparages gold as a "shiny object only suitable for fondling." And here's Steven Landsburg praising Scrooge himself, but I'm not aware that he supports a gold standard or gold as an investment. It's actually rather obvious to any external observer that something is "up" with gold bugs. There is probably some subset of this group that is "weird," but there are plenty of Austrians/Free Bankers who believe gold has some potential role to play in the monetary system for entirely rational reasons. 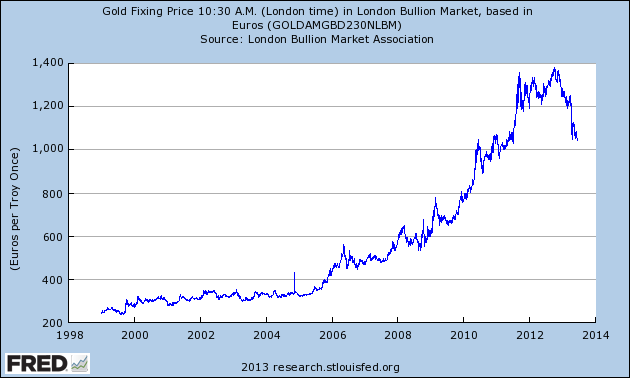 And many central banks all over the world have acquired lots of gold in recent years. Is this b/c they are all secretly Austrians? Or is it due to their "hoarding tendencies"? Yeah, gold bugism is due to hoarding. Hoarding, as Keynes knew, is different to saving which you keep confusing it with (ala Buffett). It's an irrational tendency among Austrian types and should be diagnosed as such -- much like most of Austrianism which is highly irrational and reality-denying. Ok, give me some examples of modern hoarding. Copper in China? After reading your article, I don't see any evidence that Austrians have hoarding tendencies except for your insistence that they do. I'm an Austrian (or at least Austrian influenced), and I don't have any hoarding tendencies. Am I an extreme outlier? And even Rothbard held that the ultimate purpose of all economic activity is consumption, not hoarding. So where is the evidence that Austrian = Hoarder? No JohnS ,your not full quid yet,you differ a lot from the the fanatic crowd of namecallin internet schooled Austrian trolls,that i assume you dislike as much us others,and you are a polite and sane debater,i respect your knowledge..But i agree with with Phil Pilkington,that Austrians in general have hoarding tendencies.Just look at the crowd of dismal types of Professors at Mises Inst in interviews and take a look at them.Their sit with old Bowties in rooms with old Chinese vases from Ming dynasty and 1800 century paintings and talk about Economy as Music from Mozart, Bach or Beethoven!They look like butterfly collectors all of them!Oh yes i saw that Walter Block in a interview with that Jeffrey Tucker told that Bohm-Bawerk, Mises and Rothbard,was the Bach,Mozart and Beethoven of economics, the whole room was full of "Veblian Goods! Oh yes there is defintly hoarding tendencies in the Austrian mindset.Maybee not manifest yet in your case,but i think you should be aware of it,and watch out,so it don´t pop out in full scale. Libertarians get indignant when I compare their hyperinflation doomsday beliefs to the left's advocacy of apocalyptic global warming. You can tell that ideologues have a weak case when they invoke catastrophic consequences of the current ways of doing things, which we can only prevent by adopting their radical "reforms." Yet we still use fiat money and fossil fuels, and the world just seems to muddle through without catastrophes.